We have harvested and processed seaweed products for more than 25 years, using only the most sustainable methods to protect this valuable reasource and the ecosystem where these plants and associated life thrive. we use only wild algae (we do not use farmed plants), therefore, everyone of our seaweeds are 100% organic and GM-free, this means that we bring you seaweed preperations that are exactly as nature intended; undiluted and containing their full potentcy. A sensual range of edible seaweed products containing 100% Irish seaweeds from Ireland,these nutrient rich sea vegetables find use not only as vegetarian or vegan foods, but also as foods for healing. These algae are excellent healing foods or when used as suppliment during vigourous excercise or as an aid while attempting weight loss or a effective body detox. To find out more about this aromatic and delicious range of sea vegetables click on the Seaweed Sensations™ logo. The last word in organic skin care, after all your beauty regeime needen't be grueling or potentially un healthy. Imagine being able to avoid applying artificial additives, preservatives or other potentially damaging man-made chemicals to your skin. Think of being able to use whole plants, not merely extracts. Have you ever wished for organic, GM-free wild seaweeds as nature intended them ? You will find all your natural beauty products here precisiely formulated with YOU in mind, think organic, think natural, then have skin care in mind and arrive at Phycomer™. Please click on the logo above to find out more information. In a nutshell, these products comprise of biologically active French green clay beauty products, that contain various beneficial unicelular algae. This range comprises of face and body masks and handmade soaps contianing French green clay. The marine clay minerals each natural mud mask provide a deep down cleansing action that revitalises and lifts your face, this clay detox for your face is truely relaxing. MudWorks Inc.™ is truely a uneque experience. Just click on the MudWorks Inc.™ logo above for more information. are carefully selected and hand picked, at OFS, we only use natural drying methods to preserve our sea vegetables. Our aim is to give you algae products of the highest quality and nutritional value as well as introducing our customers to the riches of the sea. 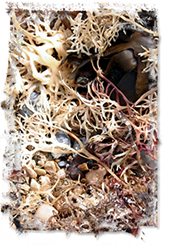 Here within, you will find a wealth of knowledge about seaweeds and their uses, nutrition. How algae can fight disease and how seaweeds can improve your appearence and overall well being. Our full product range can be found here.